Baby Shower Favor Tags and Baby Shower Favor Labels | The Final Touch! "Add That Final Christening Touch!" Baby shower favor tags and baby shower labels add that final christening touch to your unique baby shower favors, prizes and favor gifts. Make your baby shower favors look professional by adding baby shower labels or favor tags to your little favor creations. Tags and labels give your favors a professional finished look that will surely WOW your guests. Coordinate tags and labels with your packaging style and color to transform your unique baby shower favor ideas or your homemade baby shower favors into a gift that your guests will be excited to take home. Personalize and Customize to add that special touch. Most baby shower tags and labels come in two different types. One is a hang tag you can attach to a tied ribbon or bow. The other type is an adhesive label you simply peel off and stick on your favor container. We've included some excellent selections for both types below. Water bottle baby shower labels are perfect for any size or type of bottle. Remember, the same tags and labels shown for weddings can also be used for baby showers. They come in all different shapes and sizes. After you click on the image, some styles have "Baby" tabs under the product image. Tip: When selecting your personalized baby shower labels and favor tags, keep in mind the length of names and the words "shower", or "baby shower". Each style has word length specifications from which to choose. Be creative! The images below are just a sampling of creative baby shower favor tags and labels available. Click on each image and below each product you'll discover a wide variety of style, designs and colors for more unique ideas for baby shower favor tags and baby shower favor labels. Enjoy! The Mini Wooden Clothespins are such a cute addition to the Mini Favor Pails for your baby shower place settings. These simply elegant custom tags come in five different shapes. The adhesive labels are custom printed and are supplied with your choice of tin shape in a kit. Just click on Do-It-Yourself Favor Kits for tin & label assembly that's quick and easy! 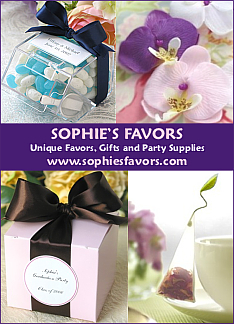 Learn how to add your own personal flair and create inexpensive favors.